Each month, Decoded Fashion, a company that fosters relationships amongst those in the fashion world, hosts their Startup Showcase. This month’s showcase, “Curation in a Box,” focused on subscriptions. Hosts Liz Bacelar and Ben Bryce presented 3 fairly new fashion tech companies, followed by a Q & A with the event’s keynote speaker, Ethan Song of Frank & Oak. The first company introduced was FreshNeck, the accessory rental-based company that recently launched in December of 2012. Co-founder David Goldberg recalled the very early days of the company when he would pack and ship men’s accessories to clients himself. Since its launch, the company has grown from 200 to 750 members and has gained a reputation as the “Netflix for ties.” FreshNeck also recently acquired one of its competitors, TieTry. The next company, presented by one of its co-founders, Andrew Apostola, was Svbscription, a service that delivers luxury parcels of unique, hand-selected products to its members on a quarterly basis. Each parcel has a different theme (e.g. travel, study) and as the company’s notoriety grows, membership sells out for each round of parcels. Members can either pay for 1 parcel at $330 or 4 per year with a subscription at $1150. And, in the midst of the rising trend of instagramming nail art, Lacquerous, the third company showcased, is a luxury nail polish service still in beta. For $18 a month, a client receives 3 polishes, which can be applied up to 3 times each. Its co-founder, Ashlene Nand, noted that the beauty market is a $10 billion business and by 2017, the nail polish sector alone will reach $7 billion. To compel a person to sign up for a subscription: Focus on the added convenience that your product truly brings. For Lacquerous, the company found that most women don’t use more than 3 applications of a nail polish a month, so their product is cost effective for women who frequently use the service. Meanwhile, Svbscription knows it’s all about that luxury experience, especially since a parcel’s contents are a mystery. FreshNeck focuses on their tier-based subscription service, which allows a range of clientele from recent graduates to established businessmen to use their services when they need to spruce up their wardrobe. Make sure that subscription service doesn’t backfire on you: A common thread amongst the companies seemed to be their careful measures of how much they spend on inventory. Return policies are built into the business models for Lacquerous and FreshNeck, thus assuring that profit isn’t lost on damaged goods. For FreshNeck, if something is only slightly damaged, they’ll clean it, but if an item is completely damaged, you’ll pay a certain percentage or have to buy the item at a discounted price. Svbscription is the only one without a return policy, but members who sign up are fully aware of this since part of the buying experience is the surprise from discovering the contents of the box. Once the press has done, “The Netflix for [insert item here],” how do you keep engagement up? Collaborate. But don’t worry if you’re not reaching the big brands right away. FreshNeck first reached out to up-and-coming designers. They began by simply phoning people to gauge their interest. The company even approached competitors, as they did with TieTry. In their niche market, collaboration has driven down costs and brought in new customers. Since its launch, FreshNeck’s partners have grown to include Alabaster & Chess, Black Lapel and Everett Clothing. Lacquerous, whose business model Nand said many people doubted, is in talks with Sephora, while Svbscription has collaborated with photographer, illustrator and author, Todd Selby and his website, TheSelby.com. Ethan Song of Frank & Oak then answered inquiries about the progression and success of his company, which produces and curates a monthly collection of menswear. In 2012, it received $5 million in Series A funding and currently has over half a million users. Song first addressed the topic of subscription itself and why that model was chosen. “We realized that guys like to be a part of a club,” said Song. Frank & Oak currently offers the Hunt Club, which allows members to pick out 3 items to be shipped and tried on at home without any obligation to buy anything. All those items are designed and produced in-house. When they first launched; however, Song said they didn’t receive traction right away, but still maintained the vision to create the accessible menswear that they had had from a previous startup that involved tailoring clothes for each customer. From that, he says, he learned how to micro manufacture and, within a year, managed to expand his company from 8 to 85 employees. Another key aspect to the company’s growing success? The Frank & Oak name, solidified in customers’ minds by its origin story. For Song, being able to tell a story about your brand is important since it allows the customer to feel more connected to it. Song explained to the audience that Frank and Oak are the street names that both founders grew up on (although Frank was shortened from Franklin to sound smoother). Cue collective “Awww” from the audience. 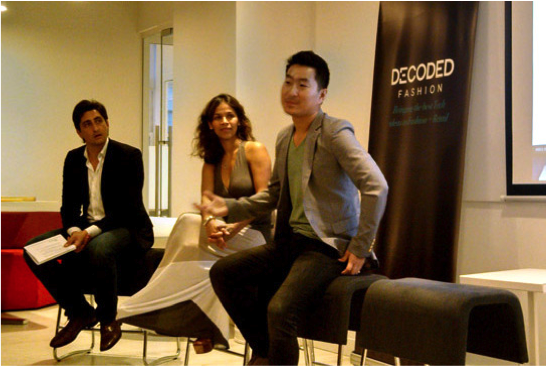 To attend future events hosted by Decoded Fashion, check out their Meetup Group.